You can see from the pattern cover that you can choose version A with a slide fastener closing (aka zipper) or view B which a button closing. It comes with long cuffed and uncuffed sleeves and short sleeves. 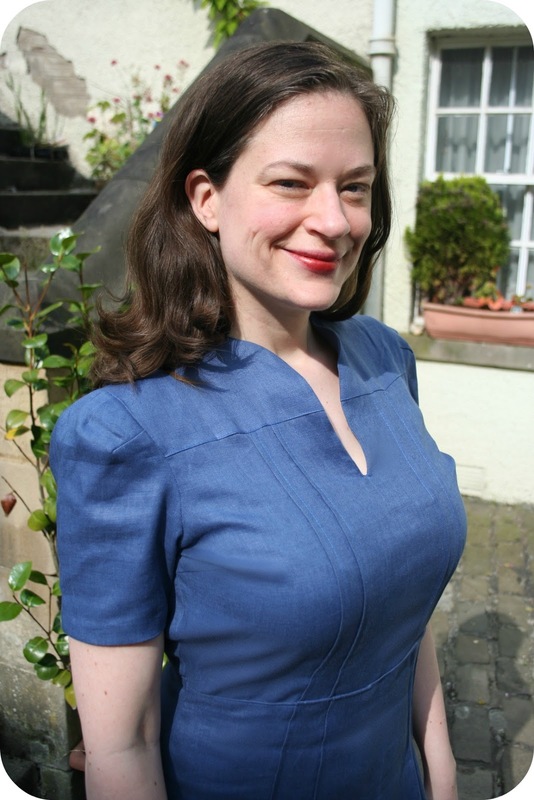 I decided to sew up view B with the short sleeves and I ended up leaving the button off the yoke front because I liked the neckline better when it wasn't so close to my neck. McCall 3774: Dime dots are the smart ones. Dotted prints are probably more important than ever before. The dotted rayon-crepe dress has the favorite high collarless neckline and the new slimmer skirt. But back to the linen dress... The yokes and waist seams are all lapped seams. 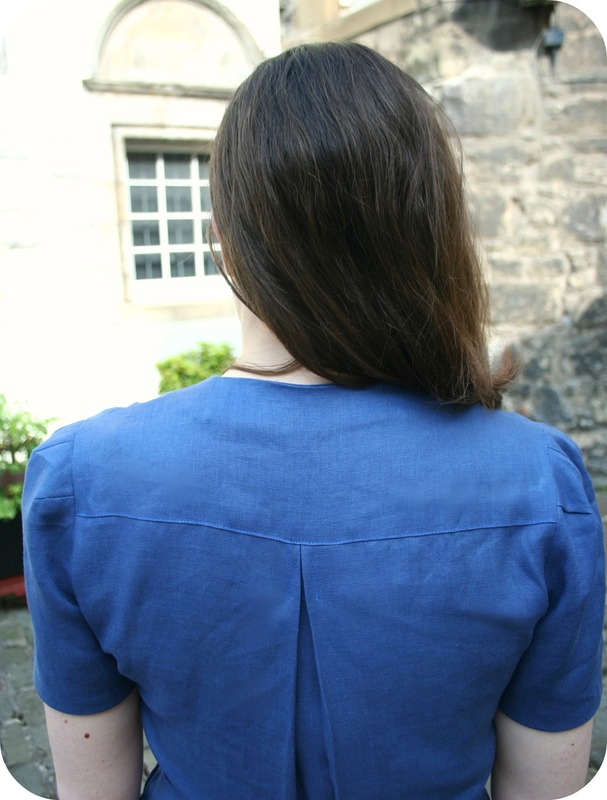 Lapped seams are much easier to sew in linen because the fabric holds a crease really well! 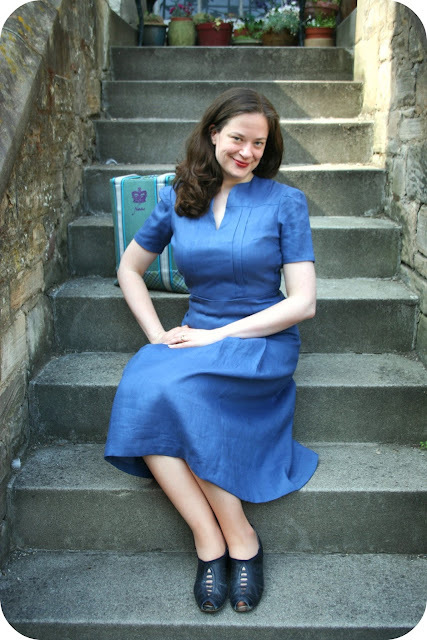 The dress also has two sets of tucks on the front bodice which line up with two sets of tucks on the skirt front. The tucks actually hide the fact that there are skirt front and skirt side pieces. 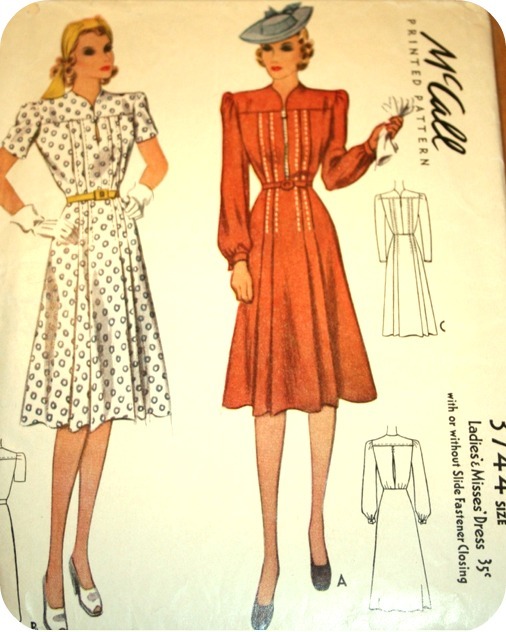 The pattern also has my favourite types of 40's sleeves--darted sleevecaps! I really like the fit of the dress. It's one of the first ones I've sewn up for the 1940 McCall Project with the slimmer skirt that started to appear from mid-1940 onwards. I left the dress a bit longer than I normally would--but I think it works well with the dress shape. I'm planning to make a matching belt too--just searching for the perfect blue belt buckle to match the fabric! This blue also matches one of my Ness jackets perfectly--so I am all prepared for Autumn as well! I can't even get over how perfect this looks on you. The shape, the color, and all the details - it's beautiful! Lovely! And the colour really suits you! Oh,what an awesome post. Seriously, the dress...the town..just gorgeous. Thank you! 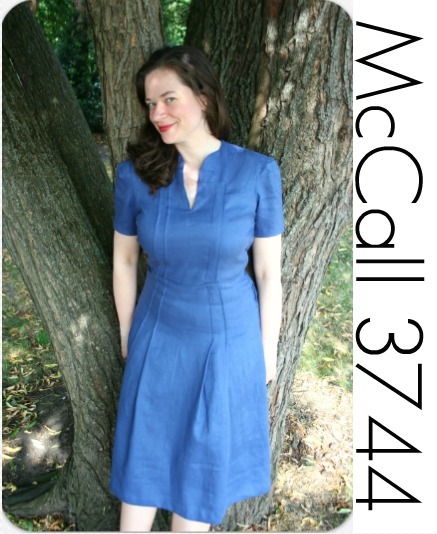 Debbie, I love the dress and the blue linen looks splendid on you. However, I am very concerned that you are wearing neither hat nor gloves. What is this world coming to? Of course, I meant "Debi" -- You see how thrown I am by your lack of hat and gloves?! Ah, such a beautiful dress! The details make it special, as does the superb fit. 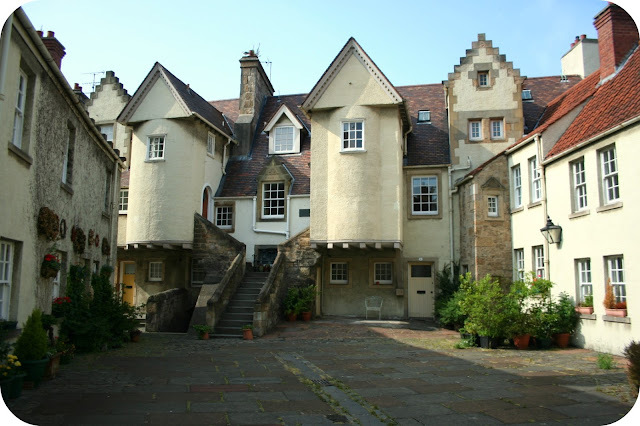 Thanks for posting pics of White Horse Close. so charming!! Oh Debi, I adore all the delicious details on this dress...it's so special and looks perfect on you!!! Wow, such an amazing dress and a beautiful colour! Debi! This is perfect! I love it so much! You look amazing! Beautiful! those darted sleeve caps are amazing. The details are incredible on a dress that appears so simple at first glance and make it that much more pretty. Very cute! The color suits you so well! Beautiful dress - really suits you and look at all the gorgeous details. Definitely a masterpiece in construction and yes, those houses are exactly a 'fairytale'. That was my first thought on seeing them! Ooooo, so lovely! All the design details are amazing. Such an awesome colour on you, Debi! Love this pattern, fabric, and color. Bravo! And your hair looks gorgeous in these photos. This is so beautiful. You just make these vintage patterns come alive again. You are so incredibly talented with your sewing and fabric choices. Gorgeous! I love the shape of the sleeve cap. Gorgeous dress Debi! It's sewn and fitted beautifully and I think you've matched the perfect fabric to show off all the pretty details. The tucks are so gorgeous and the pleat on the backside as well - I love these kind of details so much. Gorgeous!!! 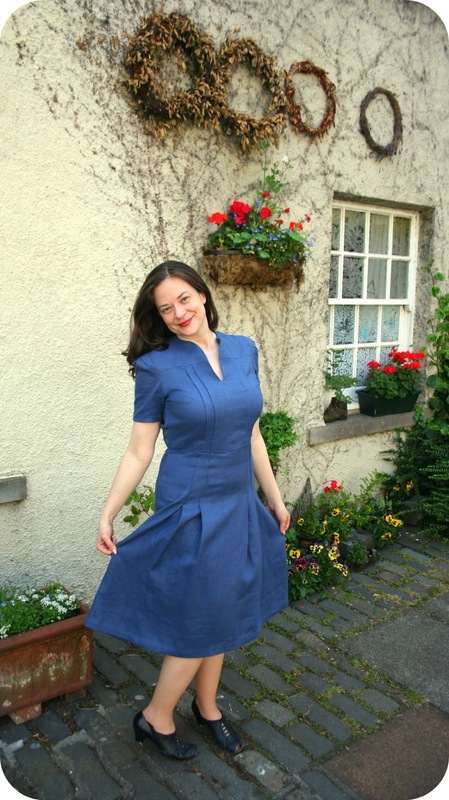 The fit is fabulous and love the details-all those amazing tucks and pleat! Love your work, dress is beautiful on you, turned out very nice. What a wonderful dress, great work !!! It's so beautiful!! And perfectly finished, as usual! I aspire to one day reach your level of attention to detail. Oh, how I love this dress! Fabulous on you..! I actually bought a rayon crepe polka-dot dress in a 40's inspired design lately, and I have to say it's a great fabric for this kind of styles. This linen is gorgeous as hell too. This is so beautifully constructed, the top stitching detail, the pintucks and darts are all just perfect. It looks wonderful on. Love it!! Love the color, the tucks, and the length! It's perfect for you, and will definitely be fabulous in your closet for all of the season transitions :) Wonderful work, my dear! This dress is just too darling! You did such an incredible job, and that blue is just dreamy on you! Adorable dress! Love the style and I think it's a perfect summer dress! Lovely dress and fabulous colour!